In 1968, my mom and dad took me with them to the local neighborhood drive-in picture show to see a movie called Paper Lion. This was a story of a writer’s (George Plimpton – played by a very young Alan Alda) short experience as a player for the Detroit Lions NFL football team. It’s a wonderful book also, by the way. While the movie was mostly adult fare, a chubby 7 year old kid enjoyed it too. Not only did I develop a liking for Alan Alda, but another fellow in that movie had a lasting effect on me. 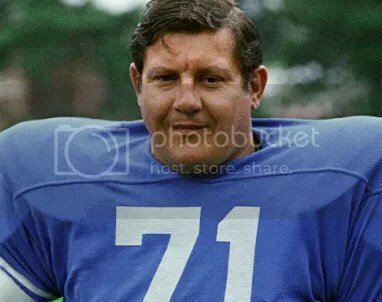 His name was Alex Karras, the outstanding defensive tackle for the Lions. Along with the Green Bay Packer’s Jerry Kramer and the Oakland Raiders George Blanda, Karras would star in this young boy’s lineup of sports heroes back then. I read some sad news in the paper the other morning. Mr. Karras had passed away at the age of 77; much too young to be leaving us already. My hero of the gridiron had succumbed to afflictions that he just could not withstand. His towering presence and tenacious aggressiveness from his prime NFL years could not save him from these attacks. His body was spent. His mind was faltering; possibly as a result of all those years on that field as a modern gladiator. Regardless of the whys and wherefores, it’s still very sad to see one of your heroes go. Mr. Karras also had a wonderful career as an actor and a sports analyst. I would hope that he had a happy and fulfilled life. I met this man once in 1969 at the Florida Suncoast Classic exhibition football game between the Lions and the Washington Redskins at the old Tampa Stadium. I was taken downstairs to the locker room area by another childhood hero of mine, my big brother Steven, to meet Mr. Karras. He shook my hand and leaned over and said to me, “You gonna’ play football when you grow up, son?” I was so in awe, I don’t think I even replied to him. The curse of a long life is that you outlive everyone that you ever loved; your heroes included. Posted by V. T. Eric Layton on 11 October 2012 in Reminiscences, Sports and tagged Alan Alda, Alex Karras, brother, Detroit Lions, football, George Plimpton, heroes, Paper Lion. I am not much a football fan but a very nice entry Eric and so true about outliving your heroes. I guess that is all part of life…. I don’t follow football much either these days, J. Baseball was always my first love, anyway. Wow, that is sad. I too am not much of a football fan, but I am a movie fan and I loved his zany part in Blazing Saddles as Mongo! Wow, 77, didn’t seem possible that he could be that old already. I still saw him the age of Mongo. I must say though that I do remember seeing him also on Webster a couple times and laughed despite myself. Really enjoyed him and Wester, despite not being much of a sitcom fan either. 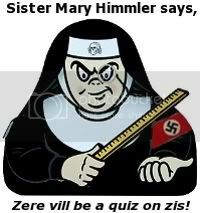 I also remember him from the one episode of M*A*S*H too, (Springtime). And who could forget his endorsement of the La-Z-Boy recliners along with some other NFL players (Joe Namath and Don Shula). Wow, Karras named one of his sons after Plimpton after he wrote about him, not once but twice. Cool!